SPECIAL OFFER - SAVE £80.00!!! The Selfsat Snipe 3 'White Line' Twin Output fully automatic satellite antenna offers an inconspicuous installation due to its new completely white stylish design. The compact form factor of the SNIPE 3 antenna takes up very little space. Even the annoying alignment at a new location is eliminated. Thanks to the integrated GPS module and electronically controlled drive, the antenna automatically aligns itself at the touch of a button. You receive your usual desired program even when traveling, as long as the respective satellite is available. 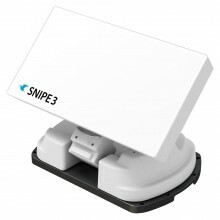 The SNIPE 3 automatically folds as soon as you turn off the receiver or start the vehicle. Click the button below to add the Selfsat Snipe v3 White Line Twin LNB Automatic Flat Antenna No Mount to your wish list.